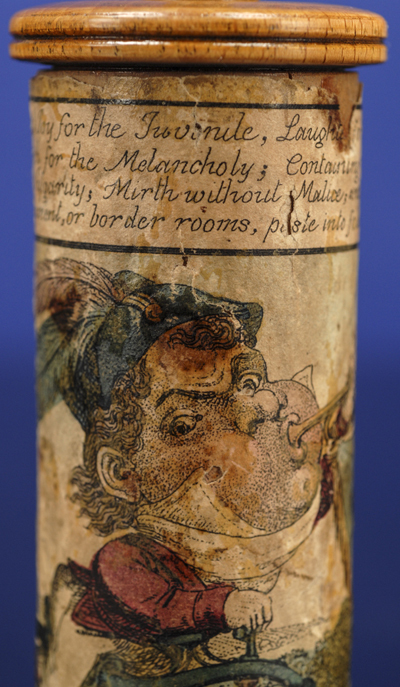 The Lillipution Museum is a panorama, in boxwood drum format, "calculated to create joy for the juvenile, laughter for the languid, fun for the feeble, sauce for the serious, and mirth for the melancholy: containing wit without indecency, humour without vulgarity, mirth without malice, and satire without personality." In short, it's meant for the bored desperate to feel blithe; the jaded in search of jolly; the zoned-out seeking zip; the depressed a dose of daffy; the gloomy, glee; the glum, glow. 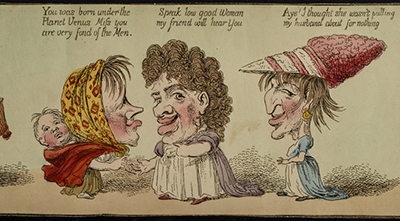 It was originally issued as Pigmy Revels; All Alive at Lilliput by George Moutard "Mustard George" Woodward in 1800-1801 as eight colored double-page plates etched by Francis Sansom and Thomas Rowlandson, each measuring 13 x 18 5/8 inches with three strip views of grotesques on each, forming a continuous series between brown wash borders. Here, the three strips to those plates have been cut apart and horizontally joined to form one long, continuous strip, the whole "In three parts, forty feet long." Yet, given that mounting a forty-foot long strip onto a drum of this size (1 5/8 in. diam.) is impossible, I speculate that publisher S.W. 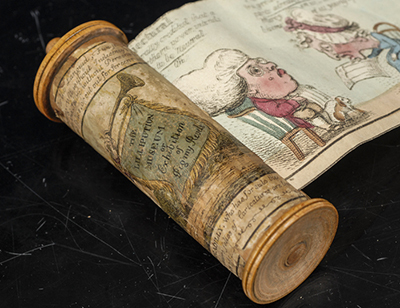 Fores used whatever of the original plates and their strips that remained from the original 1800-1801 edition, not necessarily all of them, to create this drum-edition panorama, comprised of five sections from the original. A collector reports that his copy differs from the one under notice. It is probable that no two are exactly alike. The Lillipution Museum was published without date. One section of this copy is watermarked "J. Whatman Turkey Mill" without date, which may have been lost when the original plates were sliced in three. 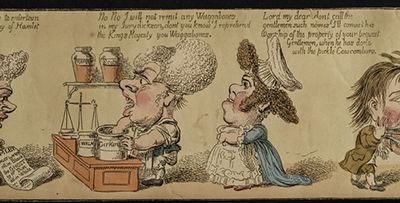 The copy that sold at Sotheby's in 1976 was watermarked 1820; a few sets of may have been restruck. Publisher S.W. Fores established his print shop, located at 3 Piccadilly, in 1783. "In 1795 Fores moved to larger premises at no. 50 Piccadilly, on the corner of Sackville Street. The number was changed to 41 about 1820..." (DNB). We can tentatively date The Lillipution Museum to c. 1819-1820). - You was born under the Planet Venus Miss you are very fond of the men. It is only slightly less scarce than the 1801 edition. OCLC notes only three copies, at Princeton, Harvard, and Toronto Public Library, with only four copies at auction since 1976. The 1801 edition is similarly found in only three libraries worldwide and has only been seen once at auction since 1976. I've had more than a few panoramas pass through my hands but only one other in boxwood drum, W.H. Mason's Brighton (Ackermann, 1833). Publication of boxwood drum panoramas was confined to c. 1819 - 1833 with most dated within the 1820s. Abbey, in Life in England, records only fourteen (a few others scrolled but not within a drum ). MASON, W.H. Brighton. Ackermann, 1833. Despite protection within sturdy drums these panoramas are fragile. I suspect that many in the past were pulled open with a little too much vigor, the paper ripped, and at some point they were tossed. Few have survived without some sort of damage. Simply drawing the panorama out by its wooden post and spooling it back via the wood screw at top will guarantee that edges will, over time and sooner rather than later, become worn with small tears. Boxwood drum panoramas are beautiful little objects, Lilliputian little or otherwise. 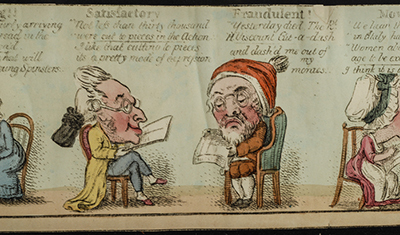 [ROWLANDSON, Thomas, engraver]. [WOODWARD, George Moutard, designer]. The Lillipution Museum or, Panoramic representation of Pigmy Revels: calculated to create joy for the juvenile, laughter for the languid, fun for the feeble, sauce for the serious, and mirth for the melancholy : containing wit without indecency, humour without vulgarity, mirth without malice, and satire without personality. London: S.W. Fores No. 50 Piccadilly, n.d. [c. 1819]. First edition in drum panorama, a strip of hand-colored engravings. Hand-colored titlepage wrapped around drum. Original boxwood drum measures 5 inches tall x 1 5/8 inches diameter. Image strip 3 3/4 x 80 inches (10 x 203 cm). The Story of Nobody, By Somebody, Illustrated By Someone. The Annals of Sporting, 1809; Or, Take This Horse And Shove It! This item will almost certainly date from c.1819, when the pedestrian hobby-horse was 'all the rage' in London and elsewhere: see www.artesius.org for three books on the topic.